At the Texas Capitol during their second week in Austin, the THSC Watchmen continued their introductory office visits. 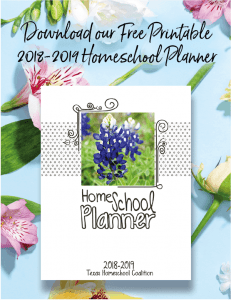 During these preliminary visits, they introduce themselves, meet the office staff and leave a business card along with literature that explains the mission of Texas Home School Coalition (THSC). On Tuesday morning, the THSC legislative team spoke to a group of citizen lobbyists on Congress Avenue about THSC and our legislative priorities for the 86th Texas Legislature. They subsequently walked up to the Capitol to finish their preliminary office visits. 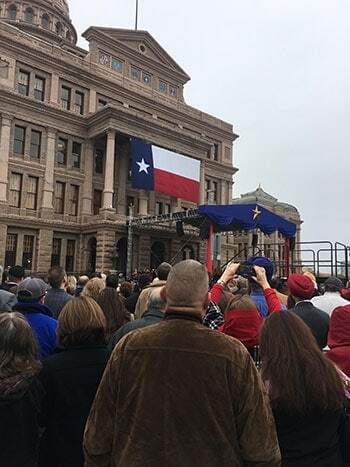 By 11 a.m., hundreds of people had gathered at the north steps of the Texas Capitol to observe the inauguration ceremonies for Governor Greg Abbott and Lieutenant Governor Dan Patrick. The THSC Watchmen witnessed the event. The speeches from both the governor and lieutenant governor highlighted the ways in which Texas leads the nation, while also acknowledging the issues in which Texas is lagging. They both expressed their desire to work toward bipartisan solutions. In the past, the THSC Watchmen have advocated for numerous bills which have gained bipartisan support, some of which passed and were signed into law. The team will continue these efforts in the 86th Texas Legislature. Consider making a donation to the THSC Watchmen today and ensure that you are signed up to receive legislative alerts. Stay up-to-date on the ways that we are Keeping Texas Families Free!